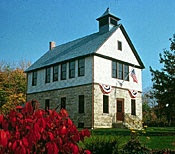 Taken from the website: "Owned and operated by the City of Cleveland Heights, the Cleveland Heights Historical Center at Superior Schoolhouse is home to an archival collection and museum committed to the presentation and preservation of Cleveland Heights' history and architecture through documentation, exhibits and special events.The school was listed as the first Cleveland Heights Landmark in 1974 and placed on the National Register of Historic Places in 1979." The first school at this site was probably built in 1859, but as years passed the school took on various forms. The Board of Education sold the school to the city of Cleveland Heights in 1958. The building was restored in 1999-2000.